We've learned that any Nissan Z makes an utterly terrible 24 Hours of LeMons car, but a super-rusty, duct-taped-together 240Z? Yes! 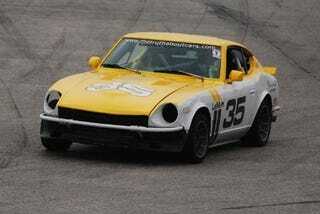 The LeMons Racing Experience 240Z, captained by the legendary Troy and veteran of a good half-dozen LeMons events, has taken the coveted Index of Effluency trophy. 28th place, only a couple of black flags, and a tiny fraction of the mechanical problems it normally gets. Congratulations, Team LRE!